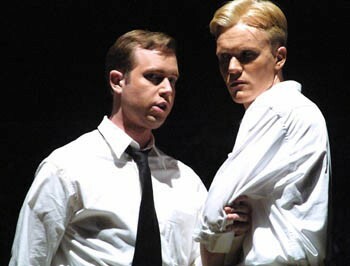 Small Town Politics: Bobby (John Wallis) and James (Matthew Hammonds) scheme and manipulate. God save us from small towns. Back in the day, everybody thought these quaint little burgs were simple places full of quirky personalities, warm apple pie, and rock-solid moral values. But if decades of American theater have taught the country one thing, it's that the sunny streets of Anytown, USA, hide a bubbling sewer of corruption and hypocrisy. The latest attempt at educating us: Lanford Wilson's Book of Days, now onstage in a Summer Repertory Theatre production directed by Leslie McCauley. The quirky characters remain, of course; where would we be without them? The population of Dublin, Mo.--an apparently bucolic place where, as one visitor explains, "the grass is so green it hurts your eyes"--includes a bumbling redneck sheriff à la Don Knotts, a former far-out hippie turned dean at a conservative Christian college, and a cheese factory employee so obsessed with creating the perfect cheddar that he delivers passionate monologues about his quest. But--surprise!--a darkness lurks on the edge of town. When a bizarre hunting accident claims the life of gruff-but-good-hearted factory owner Walt Bates (played by William McNeil), one of his employees suspects foul play. Accountant Ruth Hoch (the perky Marian Partee) sets out to investigate, in between rehearsing for her starring role in a community theater production of St. Joan, George Bernard Shaw's classic ode to Joan of Arc. Ruth soon finds that her onstage role as the persecuted idealist is dismayingly good preparation for telling the people of Dublin that one of their leading citizens has been murdered. Everyone prefers to believe the accident theory: Walt's mournful wife Sharon (Valerie Rachelle), his good-for-nothing son James (Matt Hammonds), and even Ruth's own husband, the cheese-obsessed Len (Christopher Trice). Ruth's thirst for the truth soon makes her a pariah. This murder mystery/passion play is complicated by several subplots, including a sleazy political scheme hatched by James, who hopes to make it to the state House with the help of a wily fundamentalist preacher. Unfortunately, these plot threads come together to form an ugly, crazy quilt of a play. True, the Pulitzer Prize-winning Wilson is a giant in American theater, justly acclaimed for earlier works like The Mound Builders. Also true, Book of Days is one of his weakest efforts. Wilson doesn't even deliver an adequate murder mystery. For instance, Act I concludes with Ruth discovering a clue about Walt's death that's so obvious that any cop who missed it would be busted back to dogcatcher. On the plus side, the SRT production features some good performances. Hammonds is convincingly slimy as James, a spoiled rich kid with a passion for power. And John Wallis is a wonder as the Reverend Bobby Groves. Looking and sounding eerily like former Christian Coalition frontman Ralph Reed, Wallis slides through his scenes with Teflon-coated menace. Unfortunately, Partee is not as effective in the crucial role of Ruth. The actress has good comic timing, but when other characters discuss Ruth's passionate intensity, the audience wonders if it missed a scene. Still, it's hard to blame anyone for having difficulty with this script, which is riddled with clichés, irritating tangents, implausible developments, and cheesy dialogue. In this age of Ashcroft, Wilson's themes of religious fanaticism and moral hypocrisy in middle America are timely enough. All the more reason to wish one of our leading playwrights had something new to say about them. 'Book of Days' continues through Aug. 7 at Burbank Auditorium, 1501 Mendocino Ave., Santa Rosa. For details, call Summer Repertory Theatre at 707.527.4343. From the July 18-24, 2002 issue of the North Bay Bohemian.